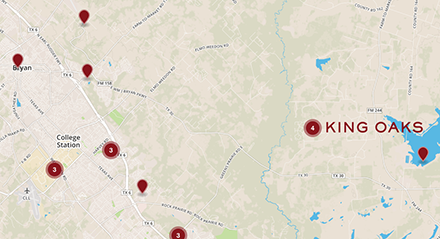 Known for its peaceful retreat from the bustle of nearby Houston and Bryan-College Station, King Oaks enjoys close proximity, yet feels like a quiet, welcoming world away. Our residents have come from all across the country, seeking space, natural beauty, well-presented amenities and friendly, intelligent and accomplished neighbors. Here at King Oaks, neighbors still wave to each other, and enjoy impromptu pot luck gatherings and nature walks. Here, you can sit on your back porch watching the wildlife scamper by, count evening stars by the thousands, or watch your grandchildren play in the pool. King Oaks takes the best of dynamic Bryan-College Station, but enjoys it at its own pace. It is a place where you can truly relax in your Brazos Valley custom home on your incredible piece of Texas land and enjoy your special place in life…but still go everywhere you want with ease.. Discover community amenities including the 60-acre nature preserve and trails, the stocked fishing pond and park, the community pool and summer kitchen as well as an outdoor fireplace. Discover the very best of Texas living today. It’s waiting for you at King Oaks.